Transportation Commissioner Steve Novick presents Executive Director of the Oregon Historical Society, Kerry Tymchuck, with Portland's last single space parking meter. Photo by Hannah Schafer, Portland Bureau of Transportation. 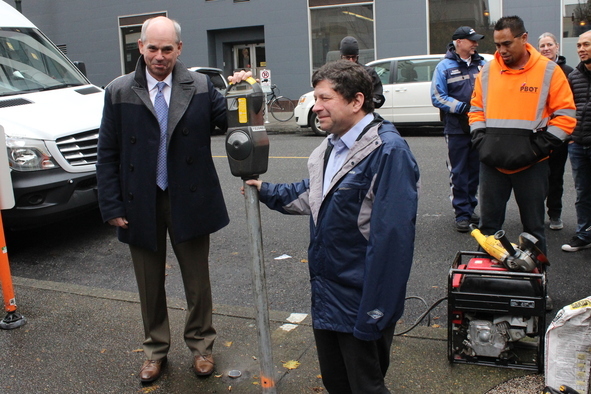 (December 1, 2016) Commissioner Steve Novick, community stakeholders and PBOT representatives officially closed an era in Portland parking history today as they retired the city's last remaining single space parking meter. Officials retired the meter in dramatic fashion, using an electric saw to separate the meter head from its post. Commissioner Steve Novick then presented the meter to Kerry Tymchuk, Executive Director of the Oregon Historical Society, for inclusion in the society's collection. "These meters have served the city well," said Commissioner Novick. "They have been an integral part of our parking management system. But they have reached the end of their useful life, and it is time to completely transition to 21st Century parking technology, like paystations and pay by phone, which are more efficient and make it easier and more convenient for Portlanders to park." "We are very excited that the Portland Bureau of Transportation has implemented new technologies to manage transportation and parking demand in the Central City," said Felicia Williams, President of the Downtown Neighborhood Association. "These advanced systems make it easier for everyone to enjoy visiting downtown, especially now that people don't have to carry around spare change to feed the meters." "The retirement of single-space meters is a signal that Portland is moving towards more effective, efficient, and flexible on-street parking management solutions," said Tony Jordan of Portlanders for Parking Reform. "By leveraging advances in plate-reading technology and mobile communications Portland can develop and implement a revolutionary citywide performance based parking solution that will provide greater convenience for consumers who drive while supporting our city's mode share, climate action, and traffic safety goals." Portland installed its first single-space parking meter in 1938. At the time, an hour of parking cost a nickel. At the height of the meter era, Portland had over 7,000 single space meters in Downtown and other parts of the city. In 2002, Portland become one of the first cities in the country to adopt the next generation of parking technology when it began to install paystations. The paystations allow customers to use credit cards or coins to pay for parking at any space on a block. Since then, PBOT has been gradually replacing single space parking meters with paystations. In the past year, PBOT has been removing the last 453 single-space meters. The meters, which do not take credit cards, have become obsolete and replacing them with paystations is more cost effective, promotes better parking management and provides a better user experience. The removal of single space meters is part of PBOT's overall effort to modernize the tools the agency uses to manage on-street parking spaces. In the first half of 2017, the agency expects to introduce two new parking solutions: mobile pay and pay by plate technology. Both tools are expected to make it easier and more convenient for users to pay for parking. Click here for a fact sheet about the history of Portland's parking meters. Click here for historic newspaper articles about Portland's first parking meters.